Fig. 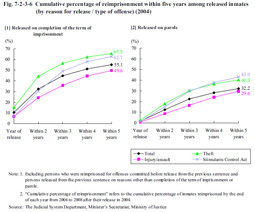 7-2-3-6 shows the cumulative percentage of inmates reimprisoned (hereinafter referred to as the “cumulative percentage of reimprisonment” in this section) as of end of each year in the period from 2004 to 2008 after being released in 2004, by reason for release (on completion of the term of imprisonment or on parole) and type of offense. By reason for release, the cumulative percentage of reimprisonment of those released on completion of the term of imprisonment was higher than that of those released on parole for each type of offense. By type of offense, the cumulative percentage of reimprisonment within five years of those released on completion of the term of imprisonment was relatively high for both theft at 65.5% and Stimulants Control Act violations at 62.7%. For theft nearly half the released inmates were reimprisoned within two years, inclusive of the year of release. However, the cumulative percentage of reimprisonment within five years of those released on parole was 43.0% for Stimulants Control Act violations and 40.3% for theft. Fig. 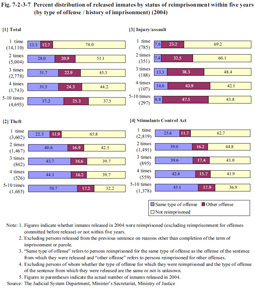 7-2-3-7 shows the rate of inmates released in 2004 who were reimprisoned (excluding those reimprisoned for offenses committed before release from the previous sentence) in penal institutions within five years for the same type of offense or another offense, by type of offense and history of imprisonment. This indicates that the reimprisonment rate increases as the history of imprisonment does, therefore their reformation/rehabilitation becomes increasingly difficult. The difference was particularly noticeable between those imprisoned for the first time and those for the second time. By type of offense the trend was particularly noticeable for theft and Stimulants Control Act violations.